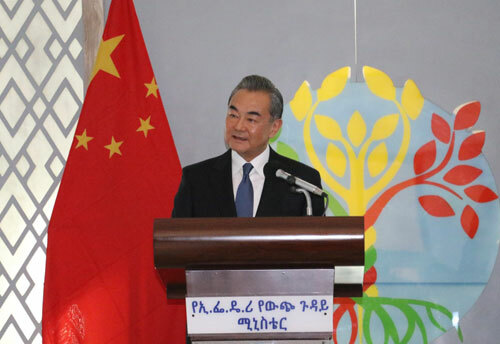 On January 3, 2019 local time, State Councilor and Foreign Minister Wang Yi and Foreign Minister Workneh Gebeyehu of Ethiopia jointly met the press with after their talks in Addis Ababa. A journalist asked Wang Yi's views on some people's thought that African countries are faced with debt issue due to their cooperation with China. Wang Yi stressed that China-Africa cooperation has always been a benchmark for South-South cooperation, as well as an acknowledged model for international cooperation with Africa. Assisting Africa's development and benefiting African people are the Chinese side's consistent original aspirations. According to incomplete statistics, over the past decades, China has assisted Africa in building more than 10,000 kilometers of highways, over 6,000 kilometers of railways and nearly 100 airports, ports and power stations. China has assisted various African countries in building countless hospitals, schools and other facilities concerning people's livelihood. China has sent over 20,000 medical workers to Africa and more than 200 million African people have benefited from their medical service. China has also invested lots of human and material resources to help Africa train hundreds of thousands of professionals in various fields. China's assistance to and cooperation with Africa have played an irreplaceable important role in facilitating Africa's economic and social development as well as improving African people's livelihood and well-being, and have also gained appreciation and welcome from various African countries. First, debt in Africa is generally a protracted issue left over from history. The African debt issue does not come up today, still less is it caused by the Chinese side. The African people know best who the initiator of Africa's debt is, and some countries are also clear about this. Wordings with the intention to discredit China are denied by the African people in the first place and refuted by many African friends, and will never disturb or influence China-Africa cooperation. Second, when carrying out cooperation with Africa in investment and financing, China has adhered to the principle of sincerity, real results, affinity and good faith and the values of friendship, justice and shared interests proposed by President Xi Jinping. China has always respected the will of the African people, and proceeded from the needs of various African countries; China has never sought selfish political gains or attached any political conditions. In the specific implementation process, we adhere to observing related laws and rules and openness and transparency, take actions in strict accordance with laws of various countries and market rules, and never allow or tolerate any back-room deals and corruption. Third, to solve the African debt issue is ultimately to make Africa achieve economic independence and sustainable development at an early date. To this end, we will, together with the African side, speed up the implementation of various outcomes of the Beijing Summit of the Forum on China-Africa Cooperation, and accelerate the advancement of eight major initiatives in collaboration with Africa that are in line with the urgent need of various African countries' future development, so as to further enhance the endogenous impetus of African economy. Meanwhile, we also call on the international community to increase attention and investment to Africa. Various parties should make concerted efforts and complement each other's strengths, so as to jointly help and bring benefit to Africa. As a comprehensive strategic cooperative partner of Africa, China has been doing this, and this is also a responsibility for other countries, especially developed countries.